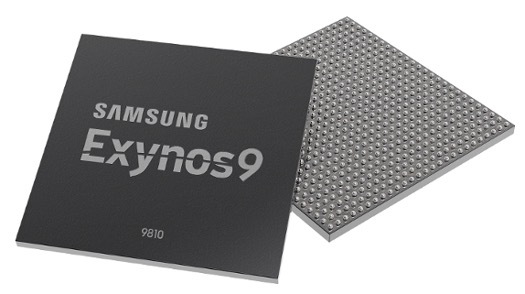 The world of Mobile CPU is going to heat up again when Samsung will launch its next Galaxy S device S9 with Exynos 9810 SOC (System On Chip aka smartphones motherboard) which will support clock speed up to 2.9 GHz. Being a next generation mobile processor it is build using 10 nm fabrication technology which will help in reducing the over all thermal envelop of the SOC and helps in reducing the over all heat generation by the smartphone. 9810 also comes with an upgraded LTE modem based on CAT.18 standard which supports download speed up to 1.2 Giga Bit Per Second (Gbps) and 200 Mega bit per second (Mbps) upload speeds. Of course these are maximum limits and are achievable under certain pre defined circumstances only. This new modem is also more reliable and stable in terms of network performance as compared to its predecessors. 9810 will also come with a discrete Image Processing hardware which will help in improving multimedia capabilities of mobile devices. This will include smooth running of Ultra HD content. Users will be able to record Ultra HD content at 120 frames per second and will also support more combination of colors. All in all 9810 is a SOC from Samsung that can give some serious competition to Qualcomm’s Snapdragon 845 and Apple’s A11 Bionic chip which Is being used in latest generation of iPhones.